All Junior Zagato's were equipped with a five speed gearbox. 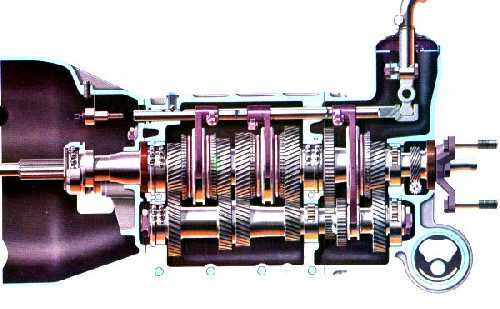 This gearbox is of excellent design and causes very little trouble. In good condition the lever slips through the gears as smoothly as the proverbial knife through the butter. The only mechanical weak spot is the second gear synchromesh which tends to wear. When test-driving the car check for ease of gear change all the way up (from first to fifth) and all the way down (from fifth to first). When cold any Alfa gearbox will baulk into second, so it's best to double-declutch or to make first to third gear changes until the oil in the gearbox is warm. Listen carefully for whining or rattling bearings and check if the gear-lever remains in its position. Gear boxes are easy to repair, if only worn synchromesh needs to be rectified you should calculate approx. DM 55,- (27,50 €) per synchro-ring. If this job is due exchange all five rings in one go. Gear rebuilt becomes rather expensive when you have to change the ball bearings. Unfortunately they are non-standard, i.e. specifically made for Alfa Romeo. Hence you can calculate approx. DM 800,- (400,- €) for the complete set of bearings. The bush underneath the three-arm flange at the end of the gear can become weak. The gear hangs lower in the bracket. Spare bush is available at a cost of 40,- DM (20,- €) and can be exchanged with a special tool without removing the gear out of the car.